TAILORED DESIGN. Make a fashionable first impression with the tailored styling of Convera seating. 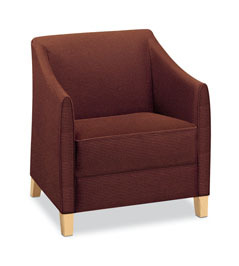 Graceful lines, rolled back, accent piping, chamfered legs: it’s dressed for success in any reception or lounge area. Convera club chairs, lounge chairs and love seats feature a choice of exposed wood or fully upholstered fronts. Available in a wide selection of textiles, the Convera collection is a welcoming addition to private office settings as well as public areas. For a complete list of textiles available on Convera please reference the current pricer pages.